You may not think of cucumbers as snacking food, but I grew up snacking on them. 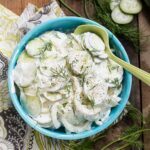 During the spring and summer months, my grandmother always had a bowl full of sliced cucumbers floating in ice water with lots of fresh dill sitting on the kitchen table. My grandmother didn’t believe in eating between meals so having this bowl of cucumbers out to snack on was a big deal. My second favorite way to snack on cucumbers is this Southern Creamy Cucumber recipe. It is an easy and delicious way to use up all those summer cucumbers. 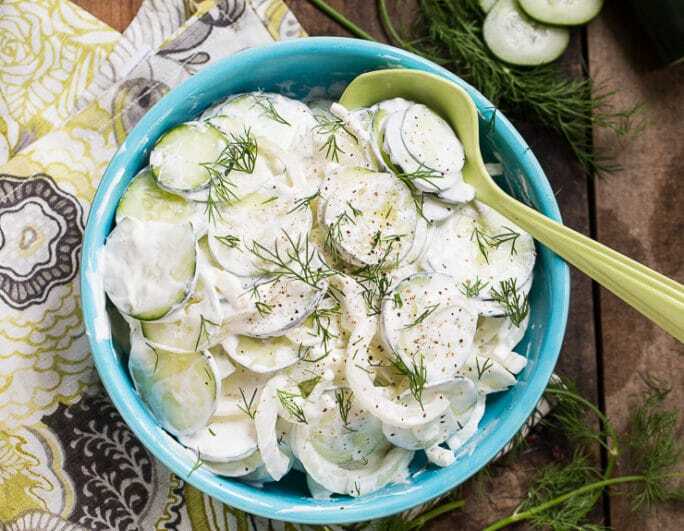 This recipe is lightened up with reduced fat sour cream and SPLENDA® No Calorie Sweetener, Granulated, so you won’t have to feel guilty if you keep going back for one more slice of cucumber! Using SPLENDA® Sweetener Products as a swap for sugar is a great way to cut calories. They have the sweetness of sugar, without all the calories and can be used in baking, cooking, and to sweeten your beverages. Try SPLENDA® Sweetener Products in your sweet tea. You’ll never miss the calories. The Sweet Swap Program is dishing out hundreds of ways to save calories by swapping full sugar for SPLENDA® Sweeteners. 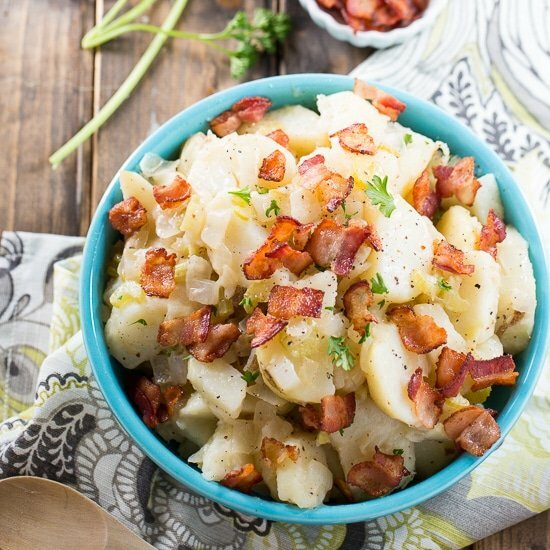 Pretty much wherever you can use sugar, you can use SPLENDA® Sweetener, like this Hot Potato Salad. In addition to sour cream and SPLENDA® Sweetener, these creamy cucumbers also have a little apple cider vinegar which gives that wonderful sweet and tart flavor. 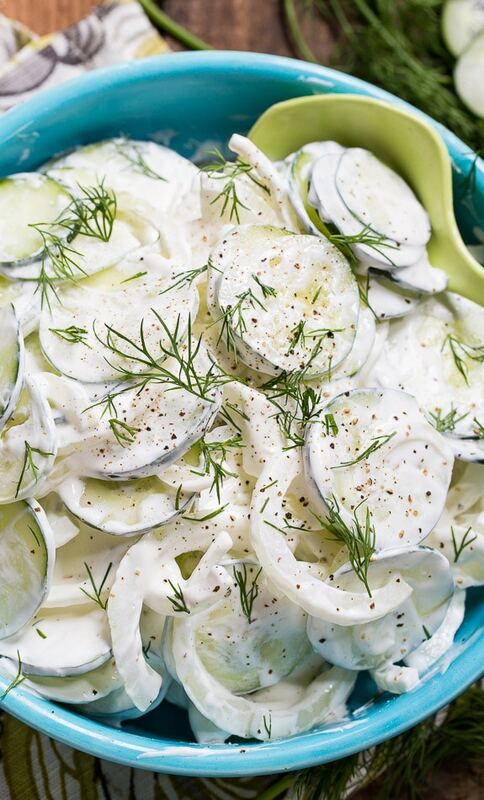 Thin slices of sweet Vidalia onion and lots of fresh dill really make this creamy snack taste like summer! Southern Creamy Cucumbers can be made in only about 5 minutes. I like to chill them for about 30 minutes before serving, but you don’t want to make them too far in advance or they will get runny as liquid starts to escape from the cucumbers into the sauce. To make it even healthier, you could use Greek yogurt instead of sour cream. 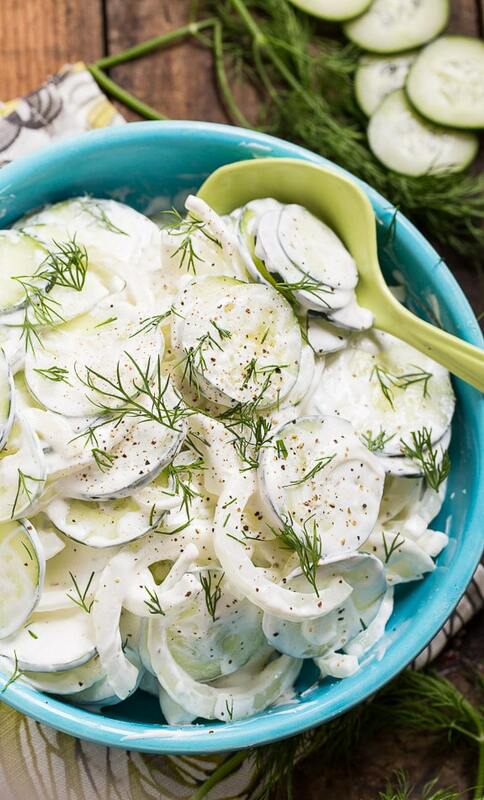 The crunchiness of cucumbers and Vidalia onions in a smooth and creamy sauce is irresistible. Try Southern Creamy Cucumbers as a refreshing snack or pair it with fried chicken or burgers for the perfect summer meal. 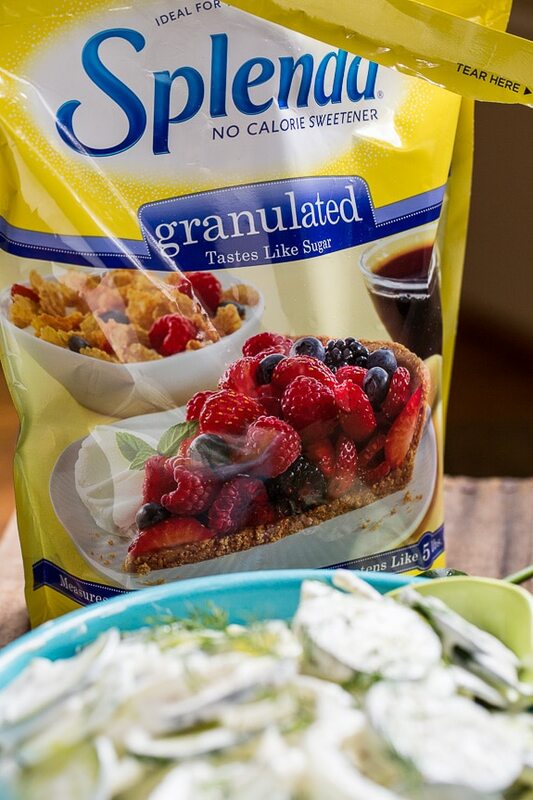 For more Splenda® Swap ideas follow Splenda® Brand on Facebook , Twitter , Pinterest , and Instagram. Southern Creamy Cucumbers have a cool and creamy, sweet and tangy sauce with lots of fresh dill and Vidalia onion. Great summer side dish. 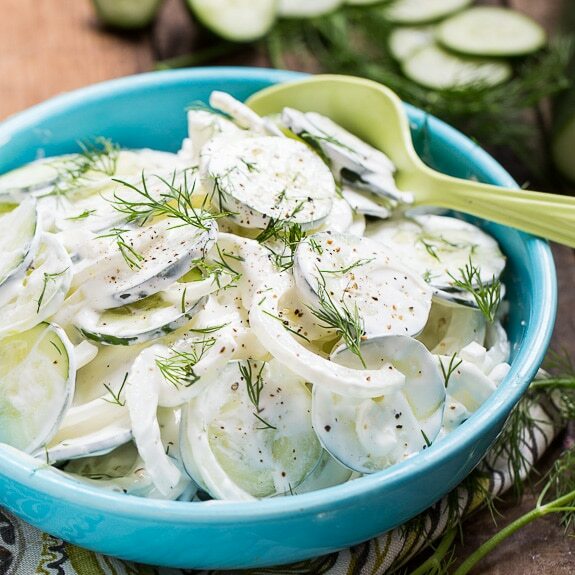 Place cucumbers and sweet onion in a medium bowl. In a small bowl, stir together sour cream, apple cider vinegar, SPLENDA® No Calorie Sweetener, Granulated, salt, pepper, and celery seed. Pour over cucumbers and toss to coat. Sprinkle dill on top. Serve immediately or chill for 30-60 minutes. Start with 3 tablespoons of vinegar and add an extra tablespoon for more tanginess. Red wine vinegar or rice vinegar can be substituted. This entry was posted in Salads, Side Dishes, Snacks and tagged Cucumbers, summer. Bookmark the permalink. I love making comforting southern dishes like this! Defintiely going to be making the recipe – creamy cucumbers just sound divine. I am in love with cucumber salads! All types, and I’m super excited to try your Southern rendition. I think I’ll swap out the Splenda for a little honey action 🙂 I’ll let you know how it goes! I love cucumbers, and your salad is both simple AND delicious (I know because I have made a similar salad for decades). BUT, one will never find “SPLENDA”, or any other artificial sweetener, in my house. Never! I really wish that foodgawker would develop a system to identify “Sponsored” posts, because I for one do not choose to read commercials — and the “…all opinions are my own” blurb does not cut it for me. Nothing personal, but I long for the “old days” when food bloggers were bloggers, NOT marketers. Be careful, my comment about pushing the Splenda was deleted. Woah…now it just reappeared when I posted, again. Sorry the ads are an inconvenience to you. I work 40+ sometimes 60+ hours a week to run this website which is used for free by over a million people a month and I need to be able to pay my bills. Oh goodness! Makes me so ready for fresh garden veggies. I love creamy cucumbers. They look fantastic! Oh yum! These cucumbers look super creamy. They would make a great addition to a barbecue! This is such a cool and refreshing side dish for all of the grilling this spring and summer. It is such a nice combination of flavors. I never really liked cucumbers when I was younger, but I just love them now — they’re so refreshing! This looks like such a delicious and unique way to enjoy them! Wahou!! I love creamy cucumbers! Cucumber salads remind me of spring 🙂 yummy! Only within the last year did I really start to appreciate cucumbers! This looks delicious! And my grandma was the same way! No snacks! Except dessert (but that’s not a snack haha). Oh man, I am just dreaming of fresh summer produce now! These look so good!